Sausage making has truly become a culinary art form, even though it’s basically made the same way it has been for hundreds of years. Fresh ground meat is mixed with salt and spices then stuffing it into casings typically made from hog intestines. Over 80% of sausage made in the U.S. is made out of pork. Beef, lamb and poultry are also used and are gaining popularity. Sausage is made in almost every country in the world. Some recipes can be linked back to their original town or country. Bratwurst is a German sausage usually made with fresh ground pork and veal. It is seasoned with salt, pepper, nutmeg and a few other spices. In Germany, you can find over 40 different varieties of Brats. They differ from one region to the next in flavor, spices and the way they are prepared. Bratwurst is very popular in Wisconsin because of its large population of German ancestors. It’s also home to the nation’s largest Bratwurst Festival!!! At my shop we make Bratwurst along with many other types of sausage. We make hot or mild Italian, Italian with green peppers and provolone cheese, Polish, Lamb, Turkey, Cajun style. We also make Brats with Portobello mushrooms and baby Swiss cheese. 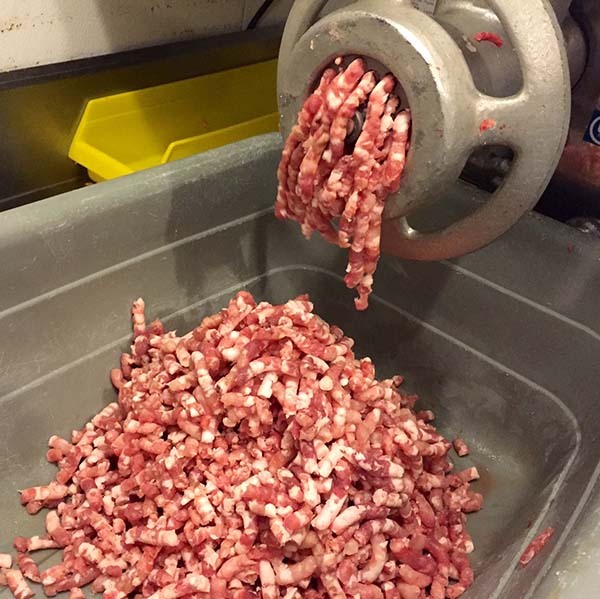 Good sausage making begins with fresh meat that is about 70% lean. We use only pork shoulders for our brats. I feel it’s just the right combination of meat to fat ratio. I love to grill fresh Bratwurst by lightly poaching them with peppers, onions and a dark lager beer in a shallow pan at medium to low heat. Then finish grilling them direct until reaching an internal temperature of 155-160 degrees. 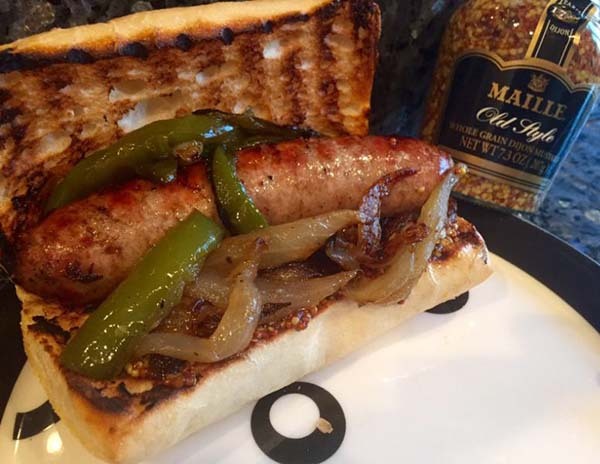 Brats are delicious when served on a toasted bun with sautéed peppers and onions, and topped with whole grain Dijon mustard… Nothing better than that!!! You know I’m German…. Use tongs to turn your sausage; not a fork. You don’t want to poke the casing and let out all the juices. Grill low and slow; fast and hot will cause the juices in the sausage to boil, making the casing burst open, resulting in a burnt outside and a raw inside. 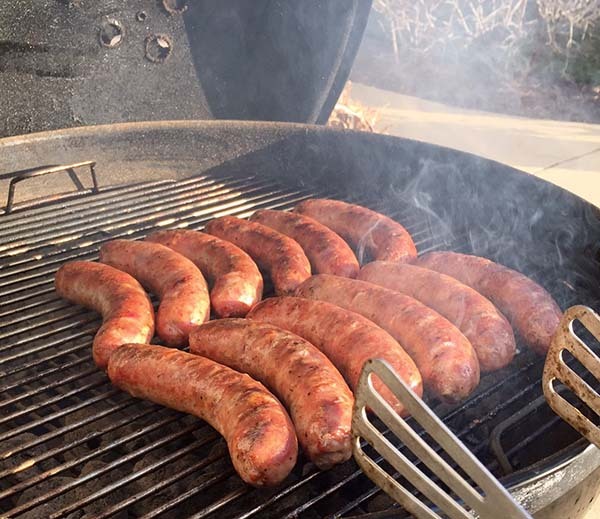 Never cut the sausage open while grilling to see if it’s done; use an instant read thermometer. Sausage is pretty inexpensive so grill enough of it to go around, and grill it often! Some type of grilled sausage is always a staple at my barbecues…. My family and friends demand it!! !